Jackson and Lauren join the angel chorus! The Heavenly hosts filled the skies today in our Journey to the Manger. After one angel came forward to proclaim that Christ the Lord had been born, the darkness was overtaken with the armies of heaven praising God. Gloria in excelsis deo echoed across the fields, and for a moment, humanity was given a glimpse of pure worship. The long-awaited Messiah had arrived, and the angels couldn’t contain their joy! 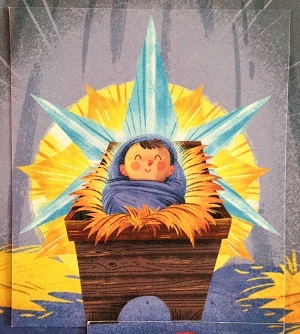 We finished our project we began on Day 5 of our Journey to the Manger, when we learned about the prophet Zechariah. We created angels with the toilet paper skirts, and added pipe cleaners for the bodies and wings, as well as bells, beads and sequins. Now, they are proudly displayed on our entertainment center to remind us of how the angels worshiped God at Christmas. The angels understood the history altering significance of God made flesh, leaving heaven’s glory to be laid gently in a feeding trough. God loved mankind so much, He sent His own Son to save them. The joy of Heaven coming to earth is what lit up the sky that night, and continues to light up our lives today. Jesus is absolutely worthy of our worship, our adoration and our praise! The kids add some bling to their angel skirts.